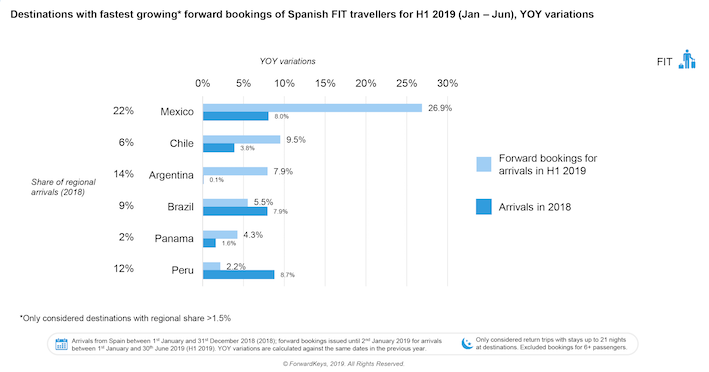 Mexico and traditional South American destinations have benefited most from independent Spanish tourists sticking with old favourites when it comes to taking a holiday break, according to latest findings from ForwardKeys which predicts future travel patterns by analysing 17 million booking transactions a day. But the Caribbean is seeing a slow-down in visitors – its share of regional arrivals from Spain last year stood at 19%, down two percentage points on 2017, and first-half forward bookings are currently behind 13.2%. Thirty per cent of independent Spanish travel outside Europe last year was to Latin America and the Caribbean, overall arrivals were up 3.6%. Forward bookings for the first half of 2109 are looking healthy too: ahead 2.7%, holding up against the rest of the world at 2.6%. ForwardKeys will discuss its finding in more detail at FITUR, the international tourism trade fair in Madrid, January 23-27. Panama, which is celebrating the 500thanniversary of its capital city with numerous events, has joined the fastest-growing destinations. Mexico, with a 22% share of regional arrivals, is seeing forward bookings surge ahead 26.9%, against last year. ForwardKeys’ research shows increased seat capacity from Spain to Latin America is helping to sustain growth, along with new scheduled routes this year. On flights to Latin America, capacity for 2019 first half is up 10.4%, although for the Caribbean it’s down 9.8%. 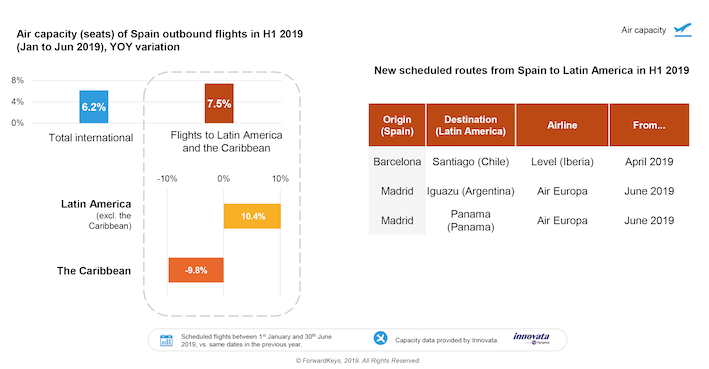 New routes are Level (Iberia) Barcelona to Santiago from April; Air Europa’s Madrid to Iguazu (Argentina), and Madrid to Panama, both starting in June. An indicator of potential travel demand outside the capital for Spanish travel to Latin America, is revealed by online searches. 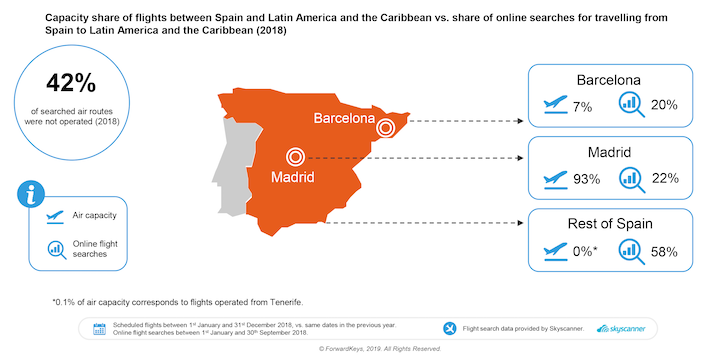 For instance, Madrid holds 93% of flight connections, but accounted for just 22% of potential demand reflected in searches. Forty-two per cent of searched-for air routes were not operated in 2018. ForwardKeys analyses more than 17m flight booking transactions a day, drawing data from all the major global air reservation systems and selected airlines and tour operators. This information is enhanced with further independent data sets, including flight searchand official government statistics, plus data science to paint a picture of who is travelling where and when. ForwardKeys’ analytics are used by travel marketers, retailers, hotels, destination marketing organisations (DMOs), financial institutions, car rental companies, tour operators, online travel agents (OTAs) and other traveller-focussed businesses worldwide to monitor and anticipate traveller arrivals from a particular origin market at a specific time. This analysis enables parties to anticipate the impact of events, better manage their staffing levels, fine tune supply requirements, adjust and measure the effectiveness of their marketing efforts and anticipate future market trends. For further information, please contact Sophie Luis, Sophie.Luis@Tarsh.comon +44 (0) 20 7112 8556 or David Tarsh, David@Tarsh.comon +44 (0) 20 7602 5262.